I haven’t seen my friend Robbi Sappingi for a number of years, and our friend status on Facebook, is still “pending” after my account was hacked several years ago (we were FB friends previously). Unfortunately, our status will be forever “pending” as Robbi was tragically killed in the 6.0 earthquake that hit Mt Kinabalu, Sabah, Malaysia yesterday 5 June 2105. 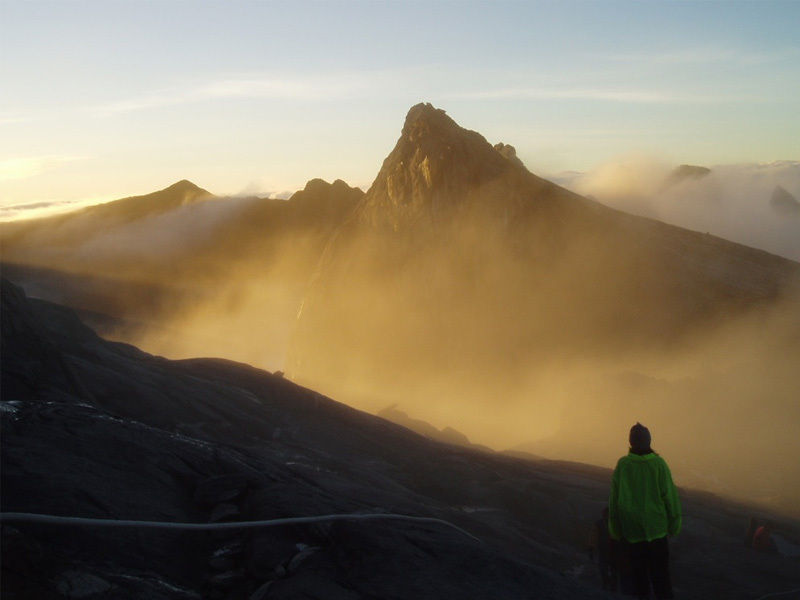 Robbi was 30 years old, and a mountain guide on “The Mountain”, Mt Kinabalu – The physical and spiritual home for the Dusun people of Kiau, a small close-knit community in Sabah, Borneo. The newspaper reports I have read say he died from head injuries sustained in the earthquake. He had been helping a climber when he was injured and encouraged them to leave him alone and climb to safety. A hero to the end, always putting others before himself. 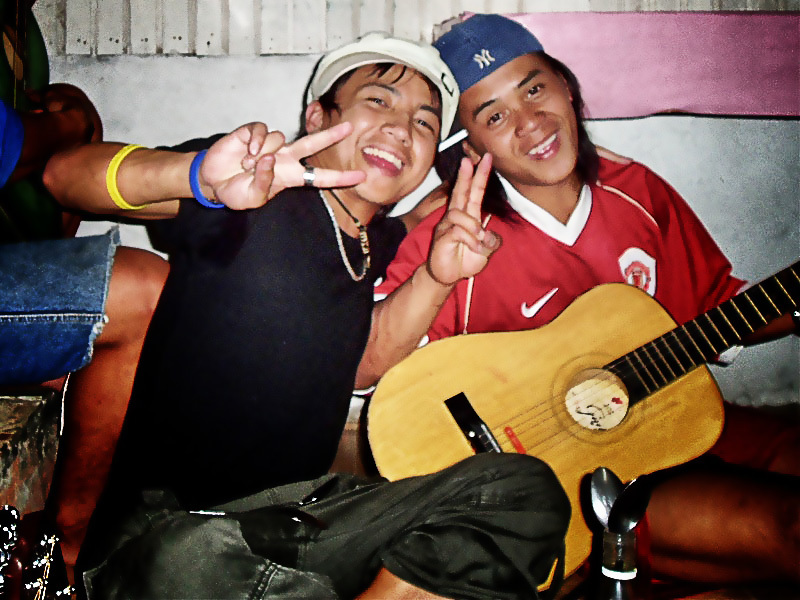 I first met Robbi when he was a cheeky schoolboy, when I began working in Borneo, regularly taking groups to climb the mountain. His Father, Sapinggi, was our head mountain guide. Part of our itinerary, we would spend a night in the village of Kiau, getting to know the locals and our guides before we climbed the mountain. We stayed in the guesthouse of the local church, and ate dinner in a local home, which inevitable turned into “the party”. Home brewed rice wine is a part of the culture of welcoming guests in this remote mountain village. It was a wonderful bonding experience for our groups, as we had all usually just met each other the day before in Kota Kinabalu. We travelled a couple of hours by minivans from the city, to be dispatched on the side of the road ‘in the middle of nowhere’ and met by an open truck to transport us over the bumpy, windy mountain road to the cool and beautiful elevated village of Kiau. Kiau village near Mt. Kinabalu, Sabah, Malaysia. Most of the group would be a little nervous, as it can be a bit confronting being thrown headfirst into an unfamiliar culture, and the imposing view of the majestic mountain reminded us that we were going to be climbing that sucker in a couple of days. “Don’t think about the mountain” Sappingi would always remind us. “The mountain is the mountain, tomorrow is tomorrow”. The people of Kiau always made us feel welcome. After a delicious home cooked dinner of local mountain fare, including the most aromatic mountain rice I have ever eaten, we would begin the introductions. This was a ceremonial raising of glasses of rice wine, followed be a formal introduction from each person present. The wine loosened tongues and made us all more relaxed. If they were not already there, Robbi and his friends would turn up to join the party, then it really got lively. Out came the guitars, the plastic bottle “drums” and spoon drumsticks. The music would be turned up loud, and the dancing would begin. A talented bunch, I often commented that they should be entrants on “Malaysian Idol”, talent show. The stilted wooden homes would often shake and we’d all be told to get off the dance floor. Unfortunately, getting off the dance floor didn’t stop the shaking yesterday when the earthquake struck. Robbi Sappingi (on left in black) entertaining my group. A couple of days later, sobered up, we would begin our climb from Mt Kinabalu National Park at about 8am. I have climbed thirty tree times over the years I worked there, not many compared to the guides who live there. The mountain is 4,095 m high, and takes two days to climb, staying overnight in mountain huts. On my first trip Robbi was on school holidays and was one of our porters, his father, Sappingi, was our guide. After he left school, Robbi began guiding full time, and more often than not, I climbed with Robbi as one of our guides. The first day is a steep 7km climb to Laban Rata, the mountain hut. It’s not too difficult for someone with good fitness, and is a beautiful mountain walk though all kinds of unique vegetation and cloud forest. The worlds tallest moss and the worlds smallest rhododendron grow here, as well as all kinds of exotic orchids and giant pitcher plants. The walk would usually take a leisurely 6-8 hours, along which Robbi would charm and entertain our groups. He always had a naughty smile, a glint in his eye and a story to tell. Funny and charming. The second day of the climb is more difficult and this is where our guides, including Robbi would really shine. We would rise at 2am to climb the short, but difficult path to the summit for sunrise, then return all the way to the bottom of the mountain. It was slow going as the altitude would often affect my groups as we would pull ourselves up by ropes on the sheer granite paths. It was cold, often below 0ºC, and usually damp or drizzling. Robbi would always help the slower climbers, holding their hands, pulling them up, encouraging them, and sharing a joke. If someone was too cold he would take off his gloves or coat to share, selflessly always putting others first. Some of my guest would have never have made the climb without Robbi’s help. Sunrise at Mt Kinabalu, Sabah, Malaysia. 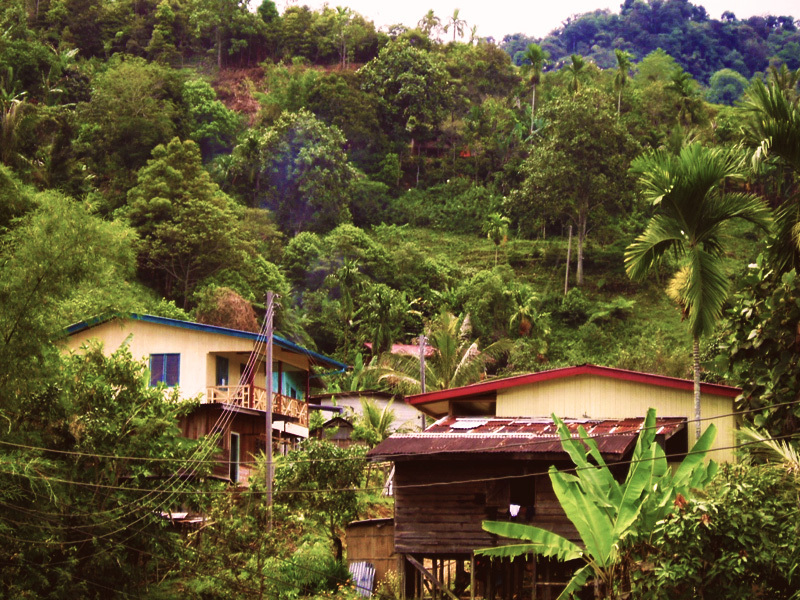 The Kiau Dusun are predominantly Roman Catholic, but still have spiritual connections to the mountain where former animist beliefs still linger. Every year they still perform a ritual sacrifice of white chickens on the mountain to appease the spirits, just in case. Borneo is not part of “the ring of fire”, that shakes up many surrounding nations on the Pacific rim, and very few have experienced even a mild earthquake before, so it was shocking and devastating for the small community. The mountain guides here are true everyday heroes. As I write this many are still trapped on the mountain, as it is still too dangerous to climb down, and visibility is too poor for helicopters. But I’m sure all the guides are helping and supporting the climbers before they think of themselves. I hope the village can be repaired and rebuilt soon. My deepest condolences go to Robbi’s family, friends and community. And to my funny and charming young friend, I say RIP – Return if possible. So true, he will be very sadly missed. He was everybody’s friend. Nice guy. Friendly. Smiling. A very good heart. A humble person. His spirit will guide those on the mountain. Thank you for your comment Julius. Yes, I believe his spirit will live on in the mountain. Thank you Mike and Carolyn. He truly was. I may not know him personally but i know him thru my father… he said that he was the Most Stylish Guide ever… my father would describe him as one of the fun & funny person … although i have not get the chance to meet him (i wish i could) but after knowing what he have done up there to save all the victims had touched me so much.. i wanted to cry when my father told me what he had done & risking his own life for it.. plus, his last words as from what my father told was just too much for me to handle… as what my father was told & said was late Uncle Robi last words “turunlah kamu..jangan kamu tunggu saya, kalau kamu tunggu kamu akan mati macam saya..”. He was bleeding at that time & his 2 guide friends was crying infront of him as he said those words… i know his 6 month year old son will never get the chance to meet him in life but i’m sure Uncle Robi is up there smiling, looking after his son,his family & help guide all the Malim Gunung to help the victims to safety…. RIP Uncle Robi.. you will be missed.. Thank you Farlina for your comment. Yep, Robbi was truly a style unto himself. He could get away with wearing the most colourful mismatched outfits, and so much fun to have around …funny boy he was. It makes me cry to read his last words. Thank you for sharing. Thank you Geraldine for your kind comment. When I heard the sad news about Robbi, I just wanted the world to know how much he will be missed me and by many others. Thanks Rosie, actually not original – it was a comment made by a mutual friend of Robbi and I, but I liked it! Malik gunung u r d great hero of our sabahan…. Be Awesome, subscribe and get other stories like this in your in box. Recipe: Observe, think, and feel. Then create.